, an eminent English historian, was descended from an ancient family of that name in Kent. His grandfather, Edward Gibbon, a citizen of London, was appointed one of the commissioners of customs under the Tory administration of the last four years of queen Anne, and was praised by lord Bolingbroke for his knowledge of commerce and finance. He was elected one of the directors of the unfortunate South-sea company, in 1716, at which time he had acquired an independent fortune of 60,000l. the whole of which he lost when the company failed in 1720. The sum of 10,000l. however, was allowed for his maintenance, and on this foundation he reared another fortune, not much inferior to the first, an<,i | secured a part of it in the purchase of landed property. He died in December 1736, at his house at Putney, and by his last will enriched two daughters, at the expence of his son Edward, who had married against his consent. 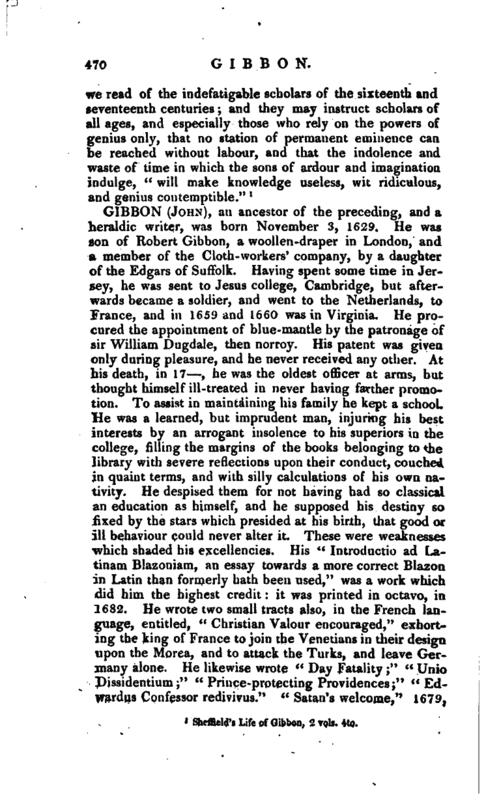 This son was sent to Cambridge, where at Emanuel college, he “passed through a regular course of academical discipline,” but left it without a degree, and afterwards travelled. On his return to England he was chosen, in 1734, member of parliament for the borough of Petersfield, and in 1741 for Southampton. In parliament he joined the party which after a long contest, finally drove sir Robert Walpole and his friends from their places. 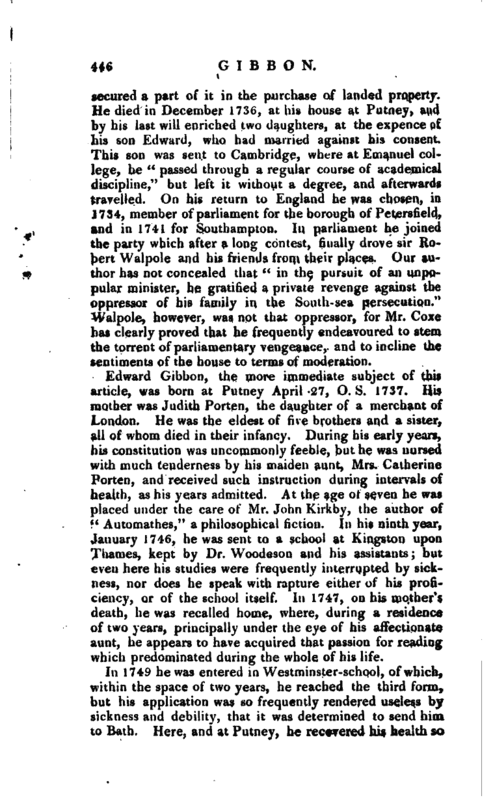 Our author has not concealed that “in the pursuit of an unpopular minister, he gratified a private revenge against the oppressor of his family in the South-sea persecution.” "Walpole, however, was not that oppressor, for Mr. CoxC has clearly proved that he frequently endeavoured to stem the torrent of parliamentary vengeance, and to incline the sentiments* of the house to terms of moderation. 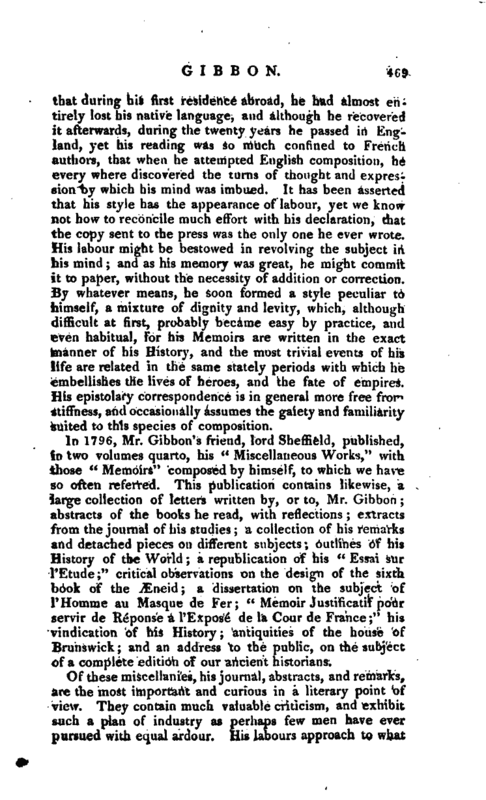 Edward Gibbon, the more immediate subject of thii article, was born at Putney April 27, O. S. 1737. His mother was Judith Porten, the daughter of a merchant of London. He was the eldest of five brothers and a sister, all of whom died in their infancy. During his early years, his constitution was uncommonly feeble, but he was nursed with much tenderness by his maiden aunt, Mrs. Catherine Porten, and received such instruction during intervals of health, as his years admitted. At the age of seven he was placed under the care of Mr. John Kirkby, the author of “Automathes,” a philosophical fiction. In his ninth year, January 1746, he was sent to a school at Kingston upon Thames, kept by Dr. Woodeson and his assistants; but even here Ins studies were frequently interrupted by sickness, nor does he speak with rapture either of his proficiency, or of the school itself. In 1747, on his mother’s death, he was recalled home, where, during a residence of two years, principally under the eye of his affectionate aunt, he appears to have acquired that passion for reading which predominated during the whole of his life. 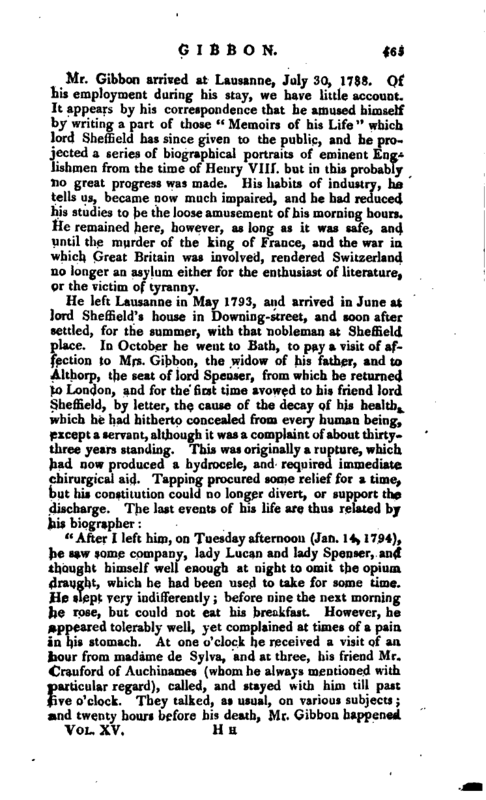 In 1749 he was entered in Westminster-school, of which, within the space of two years, he reached the third form, but his application was so frequently rendered useless by sickness and debility, that it was determined to send him to Bath. Here, and at Putney, he recovered his health so | far as to be able to return to his books, and as he approached his sixteenth year, his disorder entirely left him. The frequent interruptions, however, which he had met with, and probably a dread of the confined air of the city of Westminster, had induced his father to place him at Esher, in Surrey, in the house of the rev. Philip Francis, the translator of Horace. But his hopes were again frustrated. 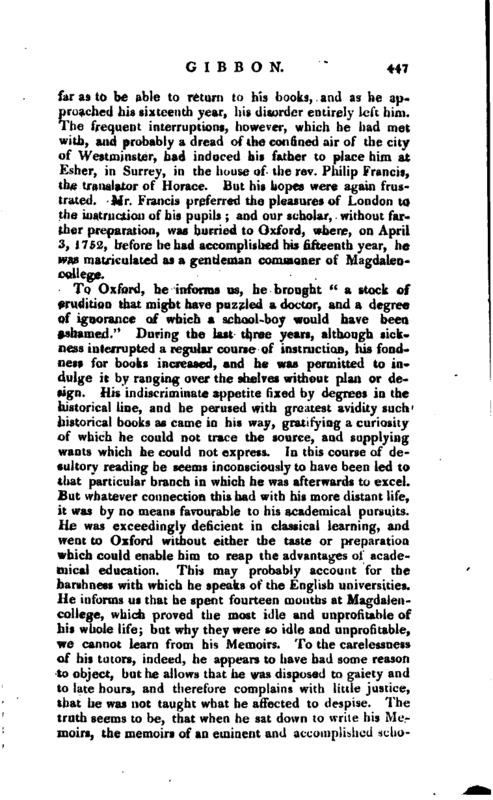 Mr. Francis preferred the pleasures of London to the instruction of his pupils; and our scholar, without farther preparation, was hurried to Oxford, where, on April 3, 1752, before he had accomplished his fifteenth year, he was matriculated as a gentleman commoner of Magdalencollege*. To Oxford, he informs us, he brought “a stock of erudition that might have puzzled a doctor, and a degree of ignorance of which a school-boy would have been ashamed.” During the last three years, although sickness interrupted a regular course of instruction, his fondBess for books increased, and he was permitted to indulge it by ranging over the shelves without plan or design. His indiscriminate appetite fixed by degrees in the historical line, and he perused with greatest avidity such historical books as came in his way, gratifying a curiosity of which he could not trace the source, and supplying wants which he could not express. In this course of desultory reading be seems inconsciously to have been led t6 that particular branch in which he was afterwards to excel. But whatever connection this had with his more distant life, it was by no means favourable to his academical pursuits. He was exceedingly deficient in classical learning, and went to Oxford without either the taste or preparation which could enable him to reap the advantages of academical education. This may probably account for the harshness with which he speaks of the English universities. He informs us that he spent fourteen months at Magdalencollege, which proved the most idle and unprofitable of his whole life; but why they were so idle and unprofitable, we cannot learn from his Memoirs. To the carelessness of his tutors, indeed, he appears to have had some reason to object, but he allows that he was disposed to gaiety and to late hours, and therefore complains with little justice, that he was not taught what he affected to despise. The truth seems to be, that when he sat down to write his Memoirs, the memoirs of an eminent and accomolisued | seholar, he found a blank which is seldom found in the bicM graphy of English scholars; the early displays of genius, the laudable emulation, and the well-earned honours; he found that he owed no fame to his academical residence, and therefore determined that no fame should be derivable from an univefsity education. 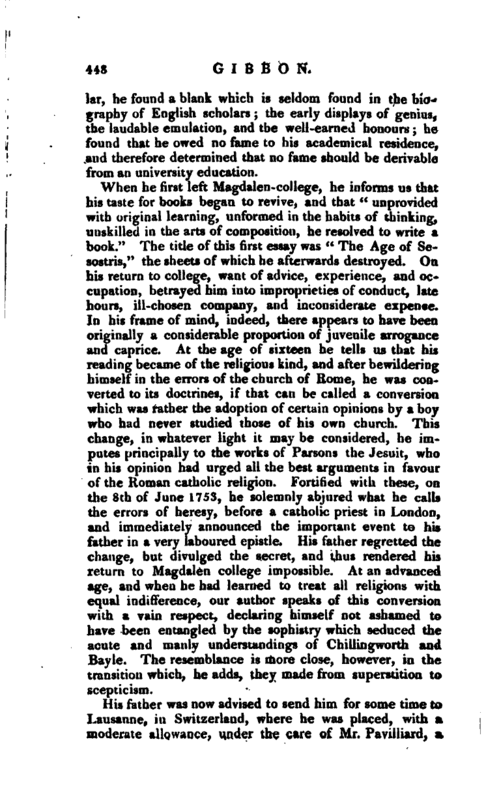 When he first left Magdalen-college, he informs us that his taste for books began to revive, and that “unprovided with original learning, unformed in the habits of thinking, unskilled in the arts of composition, he resolved to write a book.” The title of this first essay was “The Age of Sesostris,” the sheets of which he afterwards destroyed. On his return to college, want of advice, experience, and occupation, betrayed him into improprieties of conduct, late hours, ill-chosen company, and inconsiderate expense. In his frame of mind, indeed, there appears to have been originally a considerable proportion of juvenile arrogance and caprice. At the age of sixteen he tells us that his reading became of the religious kind, and after bewildering himself in the errors of the church of Rome, he was converted to its doctrines, if that can be called a conversion which was rather the adoption of certain opinions by a boy who had never studied those of his own church. This change, in whatever light it may be considered, he imputes principally to the works’ of Parsons the Jesuit, who in his opinion had urged all the best arguments in favour of the Roman catholic religion. Fortified with these, on. the 8th of Jdne 1753, he solemnly abjured what he calls the errors of heresy, before a catholic priest in London, and immediately announced the important event to his father in a very laboured epistle. His father regretted the change, but divulged the secret, and thus rendered his return to Magdalen college impossible. At an advanced age, and when he had learned to treat all religions with equal indifference, our author speaks of this conversion with a vain respect, declaring himself not ashamed to have been entangled by the sophistry which seduced the acute and manly understandings of Chillingworth and Bayle. The resemblance is more close, however, in the transition which, he adds, they made from superstition to scepticism. His father was now advised to send him fot some time to Lausanne, in Switzerland, where he was placed, with a moderate allowance, under the care of. Mr, Pavilliard, a | Calvinist minister. Mr. Pavilliard was instructed to reclaim his pupil from the errors of popery; but as he could not speak English, nor Mr. Gibbon French, some time elapsed before much conversation of any kind became practicable. When their mutual industry had removed this obstacle, Mr. Pavilliard first secured the attention and attachment of his pupil by kindness, then directed his studies into a regular plan, and placed within his power such means of information as might remove the errors into which he had fallen. This judicious method soon proved successful; on Christmas day 1754, after“a full conviction,” Mr. Gibbon received the sacrament in the church of Lausanne; and here it was, he informs us, that he suspended his religious inquiries, acquiescing with implicit belief in the tenets and mysteries which are adopted by the general consent of catholics and protestants. His ad vantages in other respects were so important during his residence at Lausanne, that here, for the first time, he appears to have commenced that regular process of instruction which laid the foundation of all his future improvements. His thirst for general knowledge returned, and while he was not hindered from gratifying his curiosity in his former desultory manner, certain hours were appropriated for regular studies. His reading had now a fixed object, and that attained, he felt the value of the acquisition, and became more reconciled to regularity and system. He opened new stores of learning and taste, by acquiring a knowledge of the Greek, Latin, and French languages. 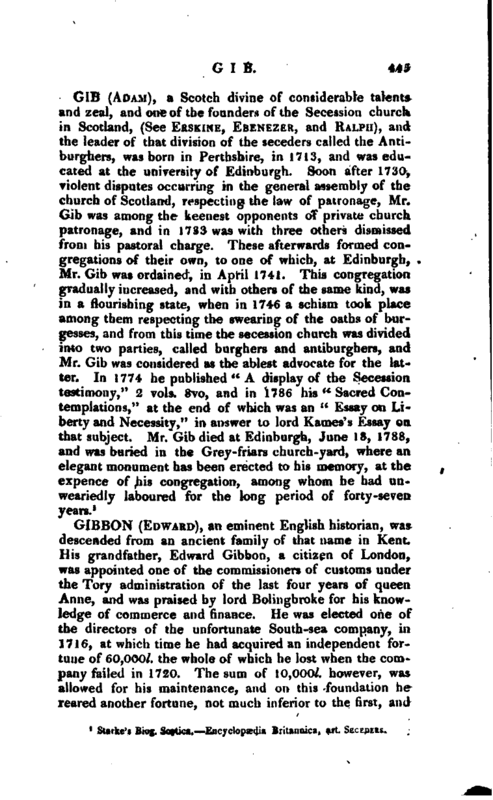 Of this proficiency, although his tutor ought not to be robbed of his share of the merit, it is evident that Mr. Gibbon’s unwearied industry and laudable avidity of knowledge were at this time uncommon, and bespoke a mind capable of the/ji’vghest attainments, and deserving of the highest honours! wkhin the compass of literature. To mathematics only, he showed a reluctance; contenting himself with understanding the principles of that science. 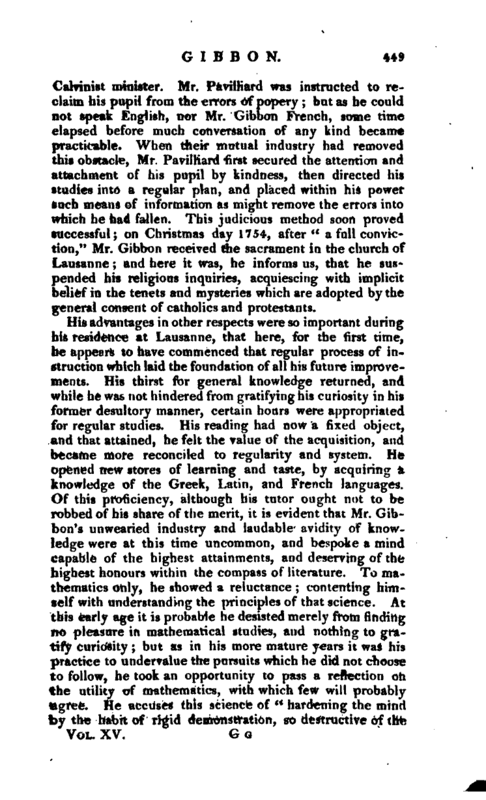 At this early age it is probable he desisted merely from finding no pleasure in mathematical studies, and nothing to gratify curiosity; but as in his more mature years it was his practice to undervalue the pursuits which he did not choose to follow, he took an opportunity to pass a reflection on the utility of mathematics, with which few will probably agree. He accuses this science of “hardening the mind by the habit of rigid demonstration, so destructive of the | finer feelings of moral evidence, which must determine the actions and opinions of our lives.” So easy is it to find a plausible excuse for neglecting what we want the power or the inclination to follow. To his classical acquirements, while at Lausanne, he added the study of Grotius, and Puffendorff, Locke, and Montesquieu; and he mentions Pascal’s “Provincial Letters,” La Bleterie’s “Life of Julian,” and Giannone’s civil “History of Naples,” as having remotely contributed to form the historian of the Roman empire. From Pascal, he tells us that he learned to manage the weapon of grave and temperate irony, even on subjects of ecclesiastical solemnity, forgetting that irony in every shape is beneath the dignity of the historical style, and subjects the historian to the suspicion that his courage and his argument are exhausted. Jt is more to his credit that at this time he established a correspondence with several literary characters, to whom he looked for instruction and direction, with Crevier and Breitinger, Gesner and Allamand; and that by the acuteness of his remarks, and his zeal for knowledge, he proved himself not unworthy of their confidence. He had an opportunity also of seeing Voltaire, who received him as an English youth, but without any peculiar notice or distinction. Voltaire diffused gaiety around him by erecting a temporary theatre, on which he performed his own favourite characters, and Mr. Gibbon became so enamoured of the French stage, as to lose much of his veneration for Shakspeare. He was now familiar in some, and acquainted in many families, and his evenings were generally devoted to cards and conversation, either in private parties, or more numerous assemblies. During this alternation of study and pleasure, he became enamoured of a mademoiselle Susan C&rchod, a young lady whose personal attractions were embellished by her virtues and talents. His addresses were favoured by her and by her parents, but his father, on being consulted, expressed the utmost reluctance to this “strange alliance,” and Mr. Gibbon yielded to his pleasure. His wound, he tells us, was insensibly healed by time, and the lady was not unhappy. She afterwards became the wife of the celebrated M. Neckar. In 1758 he was permitted to return to England, after an absence of nearly five years. His father received him with more kindness than he expected, and rejoiced in the | suecess of his plan of education. During his absence his father had married his second wife, miss Dorothea Patton, whom his son was prepared to dislike, but found an amiable and deserving woman. At home he was left at liberty to consult his taste in the choice of place, company, and amusements, and his excursions were bounded only by the limits of the island and the measure of his income. He had now reached his twenty-first year; and some faint efforts were made to procure him the employment of secretary to a foreign embassy. His step-mother recommended the study of the law; but the former scheme did not succeed, and the tatter he declined. Of his first two years in England, he passed about nine months in London, and the remainder in thecountry. But London had few charms, except the common ones that can be purchased. His father had no fixed residence there, and no circles into which he might introduce his son. He acquired an intimacy, however, in the house of David Mallet, and by his means was introduced to lady Hervey’s parties. The want of society seems never to have given him much uneasiness, nor does it appear that at any period of his life he knew the misery of having hours which he could not fill up. At his father’s house at Buriton, near Petersfield, in Hampshire, he enjoyed much leisure and many opportunities of adding to his stock of learning. 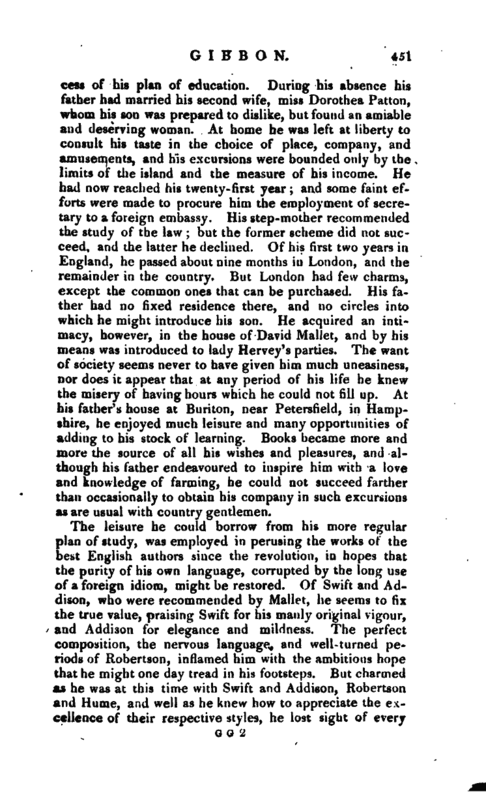 Books became more and more the source of all his wishes and pleasures, and although his father endeavoured to inspire him with a love and knowledge of farming, he could not succeed farther than occasionally to obtain his company in such excursions as are usual with country gentlemen. The leisure he could borrow from his more regular plan of study, was employed in perusing the works of the best English authors since the revolution, in hopes that the purity of his own language, corrupted by the long use of a foreign idiom, might be restored. Of Swift and Arldison, who were recommended by Mallet, he seems to fix the true value, praising Swift for his manly original vigour, and Addison for elegance and mildness. The perfect composition, the nervous language, and well-turned pe- v riods of Robertson, inflamed him with the ambitious hope that he might one day tread in his footsteps. But charmed as he was at this time with Swift and Addison, Robertson and Hume, and well as he knew how to appreciate the excellence of their respective styles, he lost sight of every | model when he became a writer of history, and formed a style peculiar to himself. In 1761 his first publication made its appearance, under the title of “Essai sur l’etude de la litterature,” a small volume in 12 mo. Part of this had been written at Lausanne, and the whole completed in London. He consulted Dr. Maty, a man of extensive learning and judgment, who encouraged him to publish the work, but this he would have probably delayed for some time, had not his father insisted upon it, thinking that some proof of literary talenta might introduce him to public notice. 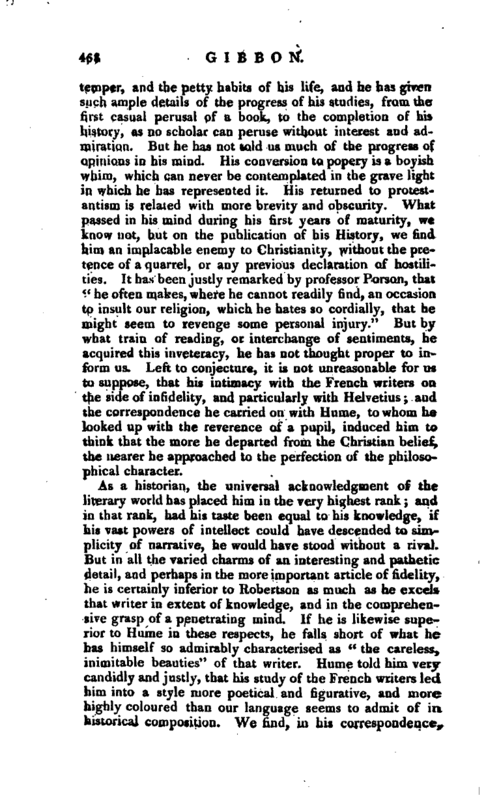 The design of this essay was to prove that all the faculties of the mind may be exercised and displayed by the study of ancient literature, in opposition to D’Alembert and others of the French encyclopedists, who contended for that new philosophy that has since produced such miserable consequences. He introduces, however, a variety of topics not immediately connected with this, and evinces that in the study of the belles lettres, and in criticism, his range was far more extensive than could have been expected from his years. His style approaches to that of Voltaire, and is often sententious and flippant, and the best excuse that can be offered for his writing in French, is, that his principal object relates to the literature of that country, with which he seems to court an alliance, and with which it is certain he was more familiar than with that of England. This essay accordingly was praised in the foreign journals, but attracted very little notice at home, and was soon forgotten. Of its merits he speaks in his Memoirs, with a mixture of praise and blame, but the former predominates, and with justice. Had the French language been then as common in the literary world as it is now, so extraordinary a production from a young man would have raised very high expectations. About the time when this essay appeared, Mr. Gibbon was induced to embrace the military profession. He was appointed captain of the south battalion of the Hampshire militia, and for two years and a half endured “a wandering life of military servitude.” It is seldom that the memoirs of a literary character are enlivened by an incident like this. Mr. Gibbon, as may be expected, could not divest his mind of its old habits, and therefore endeavoured to unite the soldier and the scholar. He studied the art of war in the Memoires Militaires of Quintus Icilius (M. | Guichardt), while from the discipline and evolutions of a modern battalion, he was acquiring a clearer notion of the phalanx and the legion, and what he seems to have valued at its full worth, a more intimate knowledge of the world, and such an increase of acquaintance as made him better known than he could have been in a much longer time, had he regularly passed his summers at Buriton, and his winters in London. 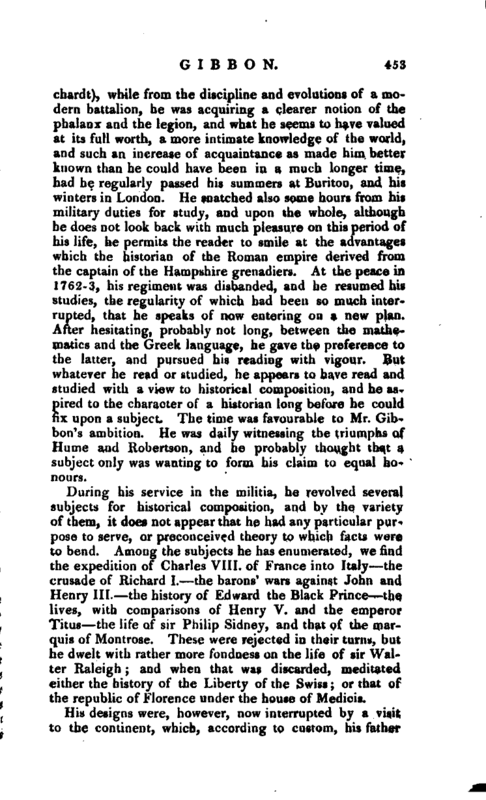 He snatched also some hours from his military duties for study, and upon the whole, although he does not look back with much pleasure on this period of his life, he permits the reader to smile at the advantages which the historian of the Roman empire derived from the captain of the Hampshire grenadiers. At the peace in 1762-3, his regiment was disbanded, and he resumed his studies, the regularity of which had been so much interrupted, that he speaks of now entering on a new plan. After hesitating, probably not long, between the mathematics and the Greek language, he gave the preference to the latter, and pursued his reading with vigour. But whatever he read or studied, he appears to have read and studied with a view to historical composition, and he aspired to the character of a historian long before he could fix upon a subject. The time was favourable to Mr. Gibbon’s ambition. He was daily witnessing the triumphs of Hume and Robertson, and he probably thought that a subject only was wanting to form his claim to equal honours. During his service in the militia, he revolved several subjects for historical composition, and by the variety of them, it does not appear that he had any particular purpose to serve, or preconceived theory to which facts were to bend. Among the subjects he has enumerated, we find the expedition of Charles VIII. of France into Italy the crusade of Richard I. the barons 1 wars against John and Henry III. the history of Edward the Black Prince the lives, with comparisons of Henry V. and the emperor Titus the life of sir Philip Sidney, and that of the marquis of Montrose. These were rejected in their turns, but he dwelt with rather more fondness on the life of sir Walter Raleigh; and when that was discarded, meditated either the history of the Liberty of the Swiss; or that of the republic of Florence under the house of Medicis. His designs were, however, now interrupted by a visit to the continent, which, according to custom, his father | thought necessary to complete the education of an English gentleman. Previous to his departure he obtained recommendatory letters from lady Hervey, Horace Walpole (the late lord Orford), Mallet, and the duke de Nivernois, to various persons of distinction in France. In acknowledging the duke’s services, he notes a circumstance which in some degree unfolds his own character, and exhibits that superiority of pretensions from which he never departed. “The duke received me civilly, but (perhaps through Maty’s fault) treated me more as a man of letters than as a man of fashion.” Congreve and Gray were weak enough to be offended on a similar account, but that Mr. Gibbon, whose sole ambition was to rise to literary fame, should have for a moment preferred the equivocal character of a man of fashion, is as unaccountable as it is wonderful that, at an advanced period of life, he should have recorded the incident. Another source of uneasiness arose from reflections on his situation. He belonged to no profession, and had adopted no plan by which he could, like his numerous acquaintance, rise to some degree of consequence. He lamented that he had not, at a proper age, embraced the lucrative pursuits of the law, or of trade, the chances of civil office, or of India adventure, or even “the fat slumbers of the church.” Still, however, such a mind as his was not formed to be inactive, and a greater portion of his dissatisfaction appears to have arisen from an impatience to acquire fame, and from the extreme length of those prospects which the various designs he formed had presented. He yet contemplated the Decline and Fall of Rome, but at an awful distance; and in the mean time, as something more within his grasp, he resumed his study of the revolutions of Switzerland, so far as to execute the first book of a history. This was read in the following winter (1767) to a literary society of foreigners in London, who did not flatter him by a very favourable opinion; yet it was praised by Hume, who endeavoured only to dissuade him from the use of the French language. The opinion, however, of the foreign critics to whom he had submitted this attempt, prevailed over that of Hume, and he renounced the design of continuing it. The manuscript is now in the possession of lord Sheffield. 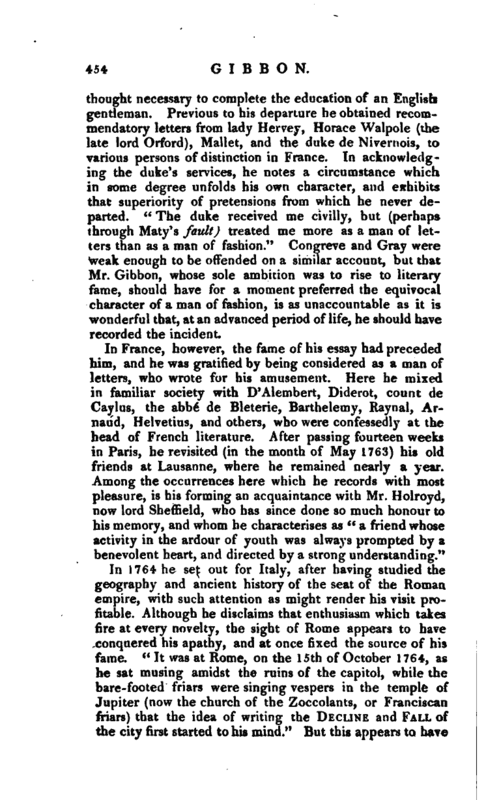 In 1767 he joined with Mr. Deyverdun, a Swiss gentleman then in England, and a man of taste and critical knowledge, to whom he was much attached, in publishing a literary Journal, in imitation of Dr. Maty’s “Journal | Britannique. 1 * They entitled it” Memoires Literaires de la Grand Bretagne.“Two volumes only of this work were published, and met with very little encouragement. 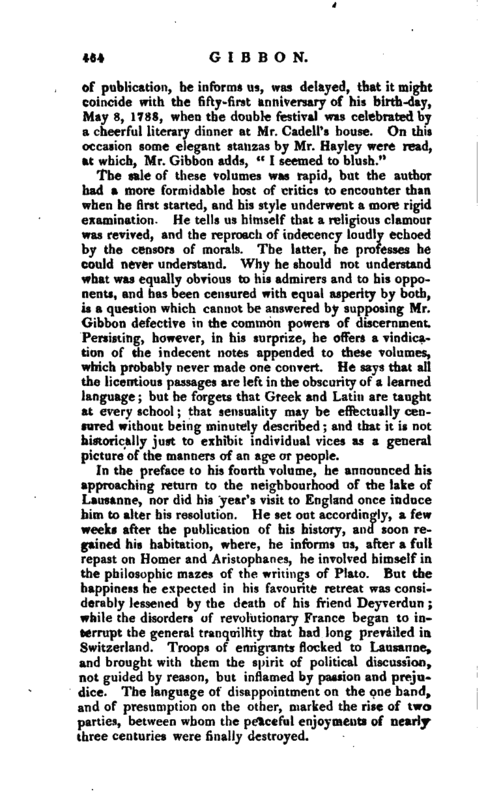 Mr. Gibbon acknowledges having reviewed lord Lyttelton’s History in the first volume. The materials of a third volume were almost completed, when he recommended his coadjutor Deyverdun as travelling governor to sir Richard Worsley, an appointment which terminated the” Memoires Literaires.“Mr. 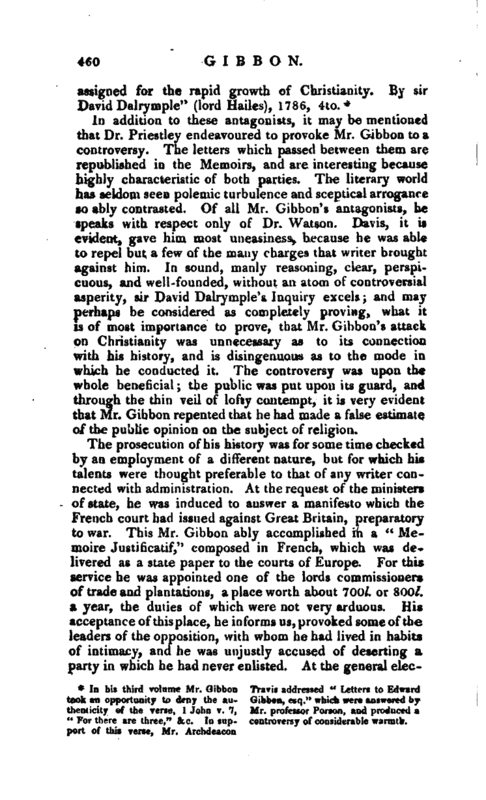 Gibbon’s next performance was an attack on Dr. Warburton, which he/ condemns for its severity and for its cowardice, while he brings the testimony of some eminent scholars to prove that it was successful and decisive. Warburton’s hypothesis on the descent of yEneas to hell had long been applauded, and if not universally adopted, had not been answered during a space of thirty years. It was the opinion of this learned writer, that the descent to hell is not a false, but a mimic scene which represents the initiation of Æneas, in the character of a law-giver, to the Eleusinian mysteries. Mr. Gibbon, on the contrary, in his” Critical Observations on the Sixth Book of the Æneid,“1770, endeavoured to prove, that the ancient law-givers did not invent the mysteries, and that Æneas never was invested with the office of law-giver that there is not any argument, any circumstance, which can melt a fable into allegory, or remove the scene from the Lake Avernos to the temple of Ceres; that such a wild supposition is equally injurious to the poet and the man; that if Virgil was not initiated he could not, if he were, be would not, reveal the secrets of the initiation; and that the anathema of Horace (vetabo qui Cereris sacrum vulgarity &c.) at once attests his own ignorance and the iimocence of his friend. 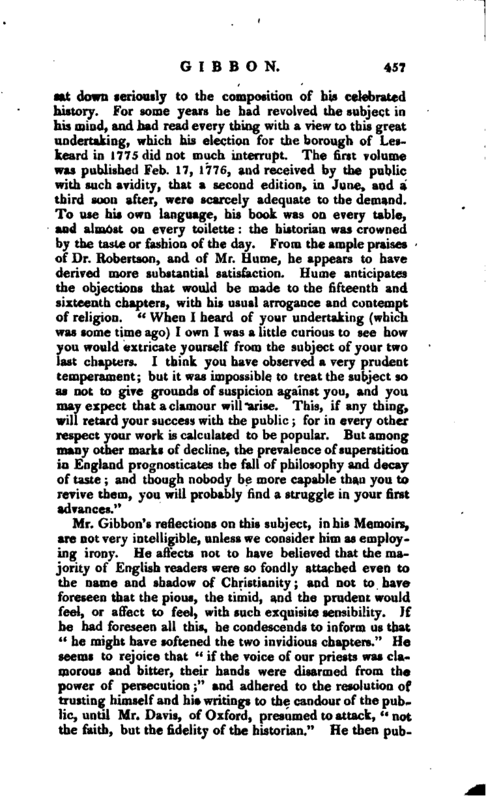 All this might have been argued in decent and respectful language, but Mr. Gibbon avows that his hostility was against the person as well as the hypothesis of” the dictator and tyrant of the world of literature," and with the acuteness of the critic, he therefore determined to join the acrimony of the polemic. In his more advanced years he affects to regret an unmanly attack upon one who was no longer able to defend himself, but he is unwilling to part with the reputation to which he thought his pamphlet entitled, or to conceal the praise which professor Heyne bestowed on it. After the death of his father in 1770, an event which left him the sole disposer of his time and inclinations, he | sat down seriously to the composition of his celebrated history. For some years he had revolved the subject in his mind, and had read every thing with a view to this great undertaking, which his election for the borough of Leskeard in 1775 did not much interrupt. The first volume was published Feb. 17, 1776, and received by the public with such avidity, that a second edition,in June, and a third soon after, were scarcely adequate to the demand. To use his own language, his book was on every table, and almost on every toilette: the historian was crowned by the taste or fashion of the day. From the ample praises of Dr. Robertson, and of Mr. Hume, he appears to have derived more substantial satisfaction. Hume anticipates the objections that would be made to the fifteenth and sixteenth chapters, with his usual arrogance and contempt of religion. *‘ When I heard of your undertaking (which was some time ago) I own I was a little curious to see how you would extricate yourself from the subject of your two last chapters. I think you have observed a very prudent temperament; but it was impossible to treat the subject so as not to give grounds of suspicion against you, and you may expect that a clamour will arise. This, if any thing, will retard your success with the public; for in every other respect your work is calculated to be popular. But among many other marks of decline, the prevalence of superstition in England prognosticates the fall of philosophy and decay of taste; and though nobody be more capable than you to revive them, you will probably find a struggle in your first advances." Mr. Gibbon’s reflections on this subject, in his Memoirs, are not very intelligible, unless we consider him as employing irony. He affects not to have believed that the majority of English readers were so fondly attached even to the name and shadow of Christianity; and not to have foreseen that the pious, the timid, and the prudent would feel, or affect to feel, with such exquisite sensibility. If he had foreseen all this, he condescends to inform us that “he might have softened the two invidious chapters.” He seems to rejoice that “if the voice of our priests was clamorous and bitter, their hands were disarmed from the power of persecution;” and adhered to the resolution of trusting himself and his writings to the candour of the public, until Mr. Davis, of Oxford, presumed to attack, ’ not the faith, but the fidelity of the historian.“He then | published his” Vindication,“which, he says,” expressive of less anger than contempt, amused for a while the busy and idle metropolis.“Of his other antagonists he speaks with equal contempt,” A victory over such antagonists was a sufficient humiliation.“It is not, however, quite certain that he obtained this victory; the silence of an author is nearly on a par with the flight of a warrior, and it is evident that the contempt which Mr. Gibbon has so lavishly poured on his antagonists, in his” Memoirs,“has more of passionate resentment than of conscious superiority.‘ Of his first resentment and his last feelings, he thus speaks” Let me frankly own, that I was startled at the first discharge of ecclesiastical ordnance but, as soon as I found that this empty noise was mischievous only in the intention, my fear was converted into indignation; and every feeling of indignation or curiosity has long since subsided into pure and placid indifference." It may not be unuseful to give in this place the titles at least, of the principal writings which his bold and disingenuous attack on Christianity called forth. These were, i. 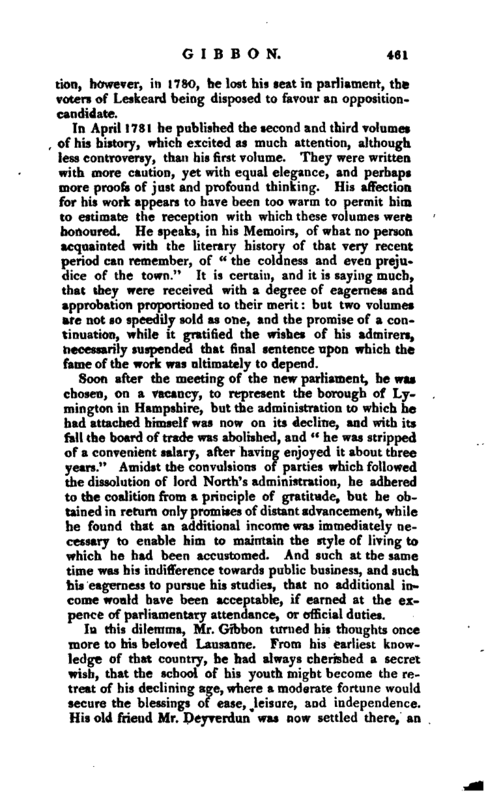 “Remarks on the two last Chapters of Mr. Gibbon’s History. In a letter to a friend.” (See Art. 8.) 2. “An Apology for Christianity, in a series of letters, addressed to Edward Gibbon, esq. By R. Watson, D. D. F. R. S. and regius professor of divinity in the university of Cambridge” (now bishop of Llandaff), 1776, 12mo. 3. “The History of the establishment of Christianity, compiled from Jewish and Heathen authors only; translated from the French of professor Bullet, &c. By William Salisbury, B. D. with notes by the translator, and some strictures on Mr. Gib ­bon’s Account of Christianity, and its first teachers,” 1776, 8vo. 4. “A Reply to the reasonings of Mr. Gibbon in his History, &c. which seem to affect the truth of Christianity, but have not been noticed in the answer which Dr. Watson hath given to that book. By Smyth Loftus, A. M. vicar of Coolock,” Dublin, 1778, 8vo. 5. “Letters on the prevalence of Christianity, before its civil establishment. With observations on a late History of the Decline of the Roman Empire. By East Apthorpe, M. A. vicar of Crovdon, 1778, 8vo. 6.” An Examination of the Fifteenth and Sixteenth Chapters of Mr. Gibbon’s History. In which his view of the progressof the Christian religion is shown to be founded on the misrepresentation of the authors he cites; and | numerous instances of his inaccuracy and plagiarism are produced. By Henry Edward Davis, B. A. of Baliol college, Oxford,“1778, 8vo. 7.” A few Remarks on the History of the Decline and Fall of the Roman Empire; relative chiefly to the Two last Chapters. By a gentleman,“8vo. 8.” Remarks on the Two last Chapters of Mr. Gibbon’s History. By James Chelsum, D. D. student of Christ Church, Oxford, and chaplain to the lord bishop of Worcester: the second edition enlarged," 1778, 12mo. This is a second edition of the Anonymous Remarks mentioned in the first article, and contains additional remarks by Dr. Randolph, Lady Margaret’s professor of divinity in the university of Oxford. Mr. Gibbon’s Vindication now appeared under the title of “A Vindication of somepassages in the Fifteenth and Sixteenth Chapters of the History of the Decline and Fall of the Roman Empire. By the author,” 1779, 8vo. This was immediately followed by 1. “A short Appeal to the public. By the gentleman who is particularly addressed in the postscript of the Vindication,” 1779-1780, 8vo. 2. 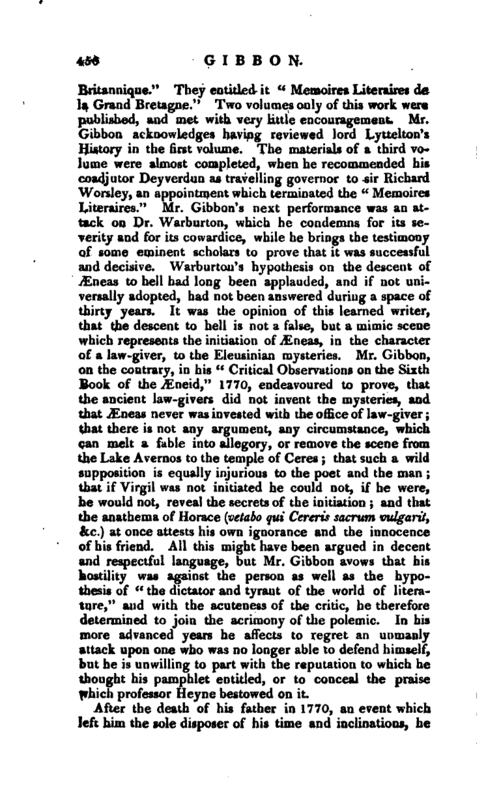 “A Reply to Mr. Gibbon’s Vindication; wherein the charges brought against him in the Examination are confirmed, and further instances given of his misrepresentation, inaccuracy, and plagiarism. By Henry Edward Davis, B. A. of Baliol college, Oxford,” 1780, 8vo. 3. 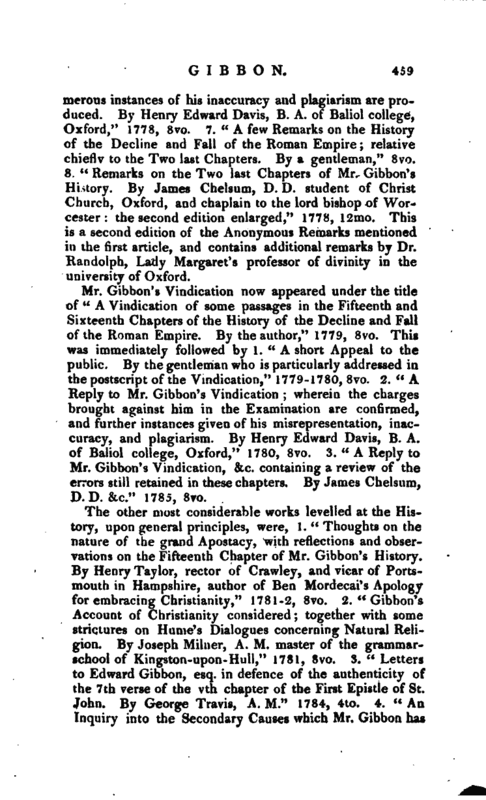 “A Reply to Mr. Gibbon’s Vindication, &c. containing a review of the errors still retained in these chapters. By James Chelsum, D. D. &c.” 1785, 8vo. In addition to these antagonists, it may be mentioned that Dr. Priestley endeavoured to provoke Mr. Gibbon to a controversy. The letters which passed between them are republished in the Memoirs, and are interesting because highly characteristic of both parties. The literary world has seldom seen polemic turbulence and sceptical arrogance so ably contrasted. Of all Mr. Gibbon’s antagonists, he speaks with respect only of Dr. Watson. Davis, it is evident, gave him most uneasiness, because he was able to repel but a few of the many charges that writer brought against him. 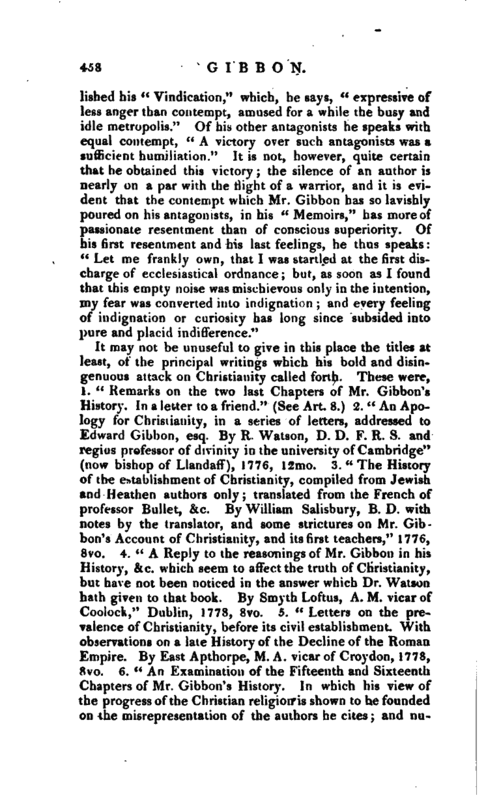 In sound, manly reasoning, clear, perspicuous, and well-founded, without an atom of controversial asperity, sir David Dalrymple’s Inquiry excels; and may perhaps be considered as completely proving, what it is of most importance to prove, that Mr. Gibbon’s attack on Christianity was unnecessary as to its connection with his history, and is* disingenuous as to the mode in which he conducted it. The controversy was upon the whole beneficial; the public was put upon its guard, and through the thin veil of lofty contempt, it is very evident that Mr. Gibbon repented that he had made a false estimate of the public opinion on the subject of religion. The prosecution of his history was for some time checked by an employment of a different nature, but for which his talents were thought preferable to that of any writer connected with administration. At the request of the ministers of state, he was induced to answer a manifesto which the French court had issued against Great Britain, preparatory to war. 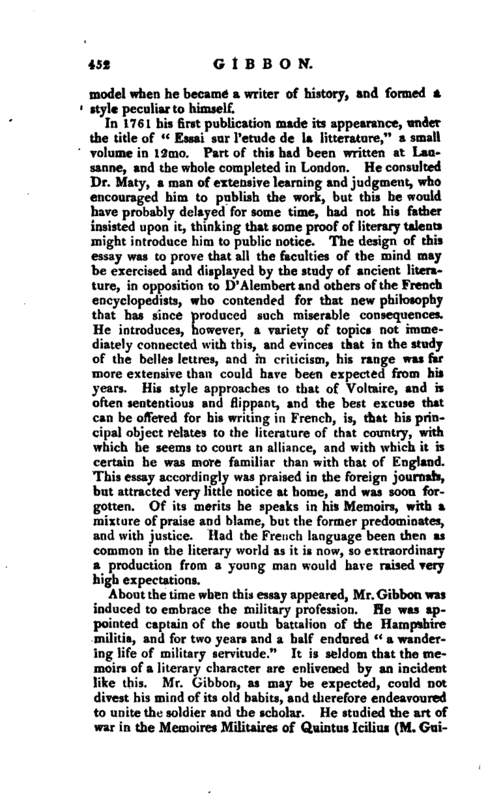 This Mr. Gibbon ably accomplished in a “Memoire Justificatif,” composed in French, which was delivered as a state paper to the courts of Europe. For this service he was appointed one of the lords commissioners of trade and plantations, a place worth about 700l. or 800l. a year, the duties of which were not very arduous. His acceptance of this place, he informs us, provoked some of the leaders of the opposition, with whom he had lived in habits of intimacy, and he was unjustly accused of deserting a party in which he had never enlisted. At the general | election, however, in 1780, he lost his seat in parliament, the voters of Leskeard being disposed to favour an oppositioncandidate. In April 1781 he published the second and third volumes of his history, which excited as much attention, although less controversy, than his first volume. They were written with more caution, yet with equal elegance, and perhaps more proofs of just and profound thinking. His affection for his work appears to have been too warm to permit him to estimate the reception with which these volumes were honoured. He speaks, in his Memoirs, of what no person acquainted with the literary history of that very recent period can remember, of “the coldness and even prejudice of the town.” It is certain, and it is saying much, that they were received witja a degree of eagerness and approbation proportioned to their merit: but two volumes are not so speedily sold as one, and the promise of a continuation, while it gratified the wishes of his admirers, necessarily suspended that final sentence upon which the fame of the work was ultimately to depend. Soon after the meeting of the new parliament, he was chosen, on a vacancy, to represent the borough of Lymington in Hampshire, but the administration to which he had attached himself was now on its decline, and with itsfall the board of trade was abolished, and “he was stripped of a convenient salary, after having enjoyed it about three years.” Amidst the convulsions of parties which followed the dissolution of lord North’s administration, he adhered to the coalition from a principle of gratitude, but he obtained in return only promises of distant advancement, while he found that an additional income was immediately necessary to enable him to maintain the style of living ta which he had been accustomed. Andsuch at the same time was his indifference towards public business, and such his eagerness to pursue his studies, that no additional income would have been acceptable, if earned at the expence of parliamentary attendance, or official duties. In this dilemma, Mr. Gibbon turned his thoughts once more to his beloved Lausanne. From his earliest knowledge of that country, he had always cherished a secret wish, that the school of his youth might become the retreat of his declining age, where a moderate fortune would secure the blessings of ease, leisure, and independence. His old frieud Mr. Deyverdun was now settled there, an | inducement of no small attraction; and to him he communicated his designs. The arrangements of friends are soon adjusted, and Mr. Gibbon, having disposed of all his effects, except his library, bid adieu to England, in September 1783, and arrived at Lausanne nearly twenty years after his second departure. His reception was such as he expected and wished, and the comparative advantages of his situation are thus stated, nearly in his own words. 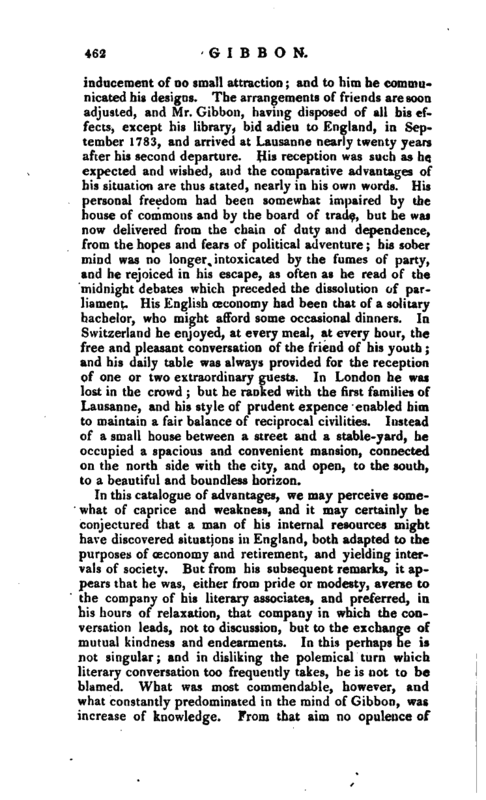 His personal freedom had been somewhat impaired by the house of commons and by the board of trade, but he was now delivered from the chain of duty and dependence, from the hopes and fears of political adventure; his sober mind was no longer intoxicated by the fumes of party, and he rejoiced in his escape, as often as he read of the midnight debates which preceded the dissolution of parliament. His English oeconomy had been that of a solitary bachelor, who might afford some occasional dinners. In Switzerland he enjoyed, at every meal, at every hour, the free and pleasant conversation of the friend of his youth; and his daily table was always provided for the reception of one or two extraordinary guests. In London he was lost in the crowd; but he ranked with the first families of Lausanne, and his style of prudent expence enabled him to maintain a fair balance of reciprocal civilities. Instead of a small house between a street and a stable-yard, he occupied a spacious and convenient mansion, connected on the north side with the city, and open, to the south, to a beautiful and boundless horizon. In this catalogue of advantages, we may perceive somewhat of caprice and weakness, and it may certainly be conjectured that a man of his internal resources might have discovered situations in England, both adapted to the purposes of ceconomy and retirement, and yielding intervals of society. But from his subsequent remarks, it appears that he was, either from pride or modesty, averse to the company of his literary associates, and preferred, in his hours of relaxation, that company in which the conversation leads, not to discussion, but to the exchange of mutual kindness and endearments. In this perhaps he is not singular; and in disliking the polemical turn which literary conversation too frequently takes, he is not to be blamed. What was most commendable, however, and what constantly predominated in the mind of Gibbon, was increase of knowledge. From that aim no opulence of | itation could have diverted him, and whatever his friends or the state might have done for him, his own scheme, the constant wish and prayer of his heart, was for a situation in which books might be procured. Dion-place book: The IVth volume of 18th, 1786, ended June 27th, 1787. The sale of these volumes was rapid, but the author had a more formidable host of critics to encounter than when he first started, and his style underwent a more rigid examination. He tells us himself that a religious clamour was revived, and the reproach of indecency loudly echoed by the censors of morals. The latter, he professes he could never understand. Why he should not understand what was equally obvious to his admirers and to his opponents, and has been censured with equal asperity by both, is a question which cannot be answered by supposing Mr. Gibbon defective in the common powers of discernment. Persisting, however, in his surprize, he offers a vindication of the indecent notes appended to these volumes, which probably never made one convert. He says that all the licentious passages are left in the obscurity of a learned language; but he forgets that Greek and Latin are taught at every school; that sensuality may be effectually censured without being minutely described; and that it is not historically just to exhibit individual vices as a general picture of the manners of an age or people. In the preface to his fourth volume, he announced his approaching return to the neighbourhood of the lake of Lausanne, nor did his year’s visit to England once induce him to alter his resolution. He set out accordingly, a few weeks after the publication of his history, and soon regained his habitation, where, he informs us, after a full repast on Homer and Aristophanes, he involved himself in the philosophic mazes of the writings of Plato. But the happiness he expected in his favourite retreat was considerably lessened by the death of, his friend Deyverdun; while the disorders of revolutionary France began to interrupt the general tranquillity that had long prevailed in Switzerland. Troops of emigrants flocked to Lausanne, and brought with them the spirit of political discussion, not guided by reason, but inflamed by passion and prejudice. The language of disappointment on the one hand, and of presumption on the other, marked the rise of two parties, between whom the peaceful enjoyments of nearly three centuries were finally destroyed. 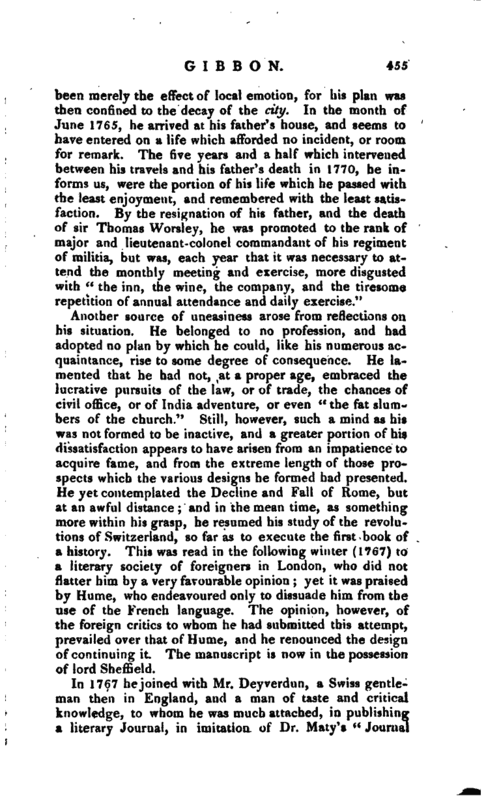 | Mr. Gibbon arrived at Lausanne, July 30, 1788. Of his employment during his stay, we have little account. It appears by his correspondence that he amused himself by writing a part of those “Memoirs of his Life” which lord Sheffield has since given to the public, and he projected a series of biographical portraits of eminent Englishmen from the time of Henry VIII. but in this probably no great progress was made. His habits of industry, he tells us, became now much impaired, and he had reduced his studies to be the loose amusement of his morning hours. He remained here, however, as long as it was safe, and until the murder of the king of France, and the war in which Great Britain was involved, rendered Switzerland no longer an asylum either for the enthusiast of literature, or the victim of tyranny. "After I left him, on Tuesday afternoon (Jan. 14, 1794), he saw some company, lady Lucan and lady Spenser, and thought himself well enough at night to omit the opium draught, which he had been used to take for some time. He slept very indifferently; before nine the next morning he rose, but could not eat his breakfast. However, he appeared tolerably well, yet complained at times of a pain in his stomach. At one o‘clock he received a visit of an hour from madame de Sylva, and at three, his friend Mr. Crauford of Auchinames (whom he always mentioned with particular regard), called, and stayed with him till past five o’clock. 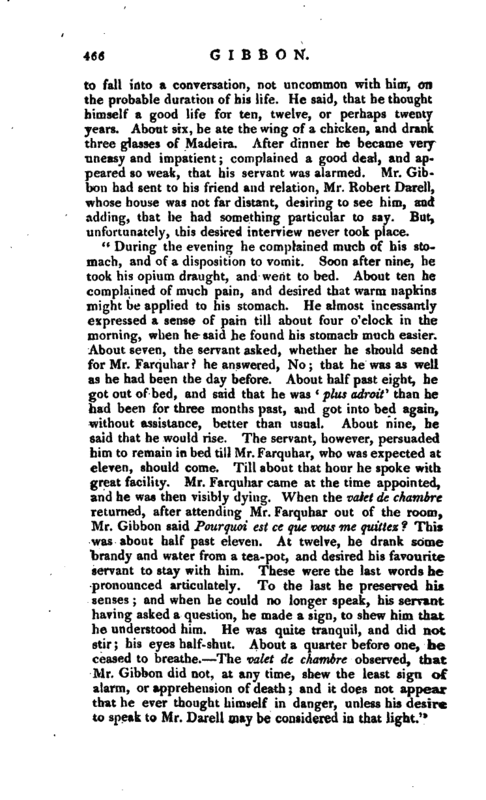 They talked, as usual, on various subjects; and twenty hours before his death, Mr. Gibbon happened | to fall into a conversation, not uncommon with him, on the probable duration of his life. He said, that he thought himself a good life for ten, twelve, or perhaps twenty years. About six, he ate the wing of a chicken, and drank three glasses of Madeira. After dinner he became very uneasy and impatient; ‘complained a good deal, arul appeared so weak, that his servant was alarmed. Mr. Gibbon had sent to his friend and relation, Mr. Robert Darell, whose house was not far distant, desiring to see him, and adding, that he had something particular to say. But, unfortunately, this desired interview never took place. “During the evening he complained much of his stomach, and of a disposition to vomit. Soon after nine, he took his opium draught, and went to bed. About ten he complained of much pain, and desired that warm napkins might be applied to his stomach. He almost incessantly expressed a sense of pain till about four o‘clock in the morning, when he said he found his stomach much easier. About seven, the servant asked, whether he should send for Mr. Farquhar? he answered, No; that he was as well as he had been the day before. About half past eight, he got out of bed, and said that he was ’ plus adroit” 1 than he had been for three months past, and got into bed again, without assistance, better than usual, x About nine, he said that he would rise. The servant, however, persuaded him to remain in bed till Mr. Farquhar, who was expected at eleven, should come. Till about that hour he spoke with great facility. Mr. Farquhar came at the time appointed, and he was then visibly dying. When the valet dc chambre returned, after attending Mr. Farquhar out of the room, Mr. Gibbon said Pourauoi est ce que vous me guides? This was about half past eleven. At twelve, he drank some brandy and water from a tea-pot, and desired his favourite servant to stay with him. These were the last words he pronounced artijculately. To the last he preserved his senses; and when he could no longer speak, his servant having asked a question, he made a sign, to shew him that he understood him. He was quite tranquil, and did not stir; his eyes half- shut. About a quarter before one, he ceased to breathe. The valet de chambre observed, that Mr. Gibbon did not, at any time, shew the least sign of alarm, or apprehension of death; and it does not appear that he ever thought himself in danger, unless his desire to speak to Mr. Darell may be considered in that light.’ 7 | Other reports of Mr. Gibbon’s death were circulated at the time, But the above proceeds from an authority which cannot be doubted. The religious public was eager to know the last sentiments of Mr. Gibbon on the important point which constituted his grand defect, but we find that there were no persons near him at his death to whom that was a matter of curiosity; and it appears that he did not think his end approaching until he became incapable of collecting or expressing his thoughts. If he has, therefore, added one more to the number of infidels who have died in full possession of their incredulity, let it be remembered that, as he saw no danger, he had no room to display the magnanimity which has been ostentatiously ascribed to dying sceptics. 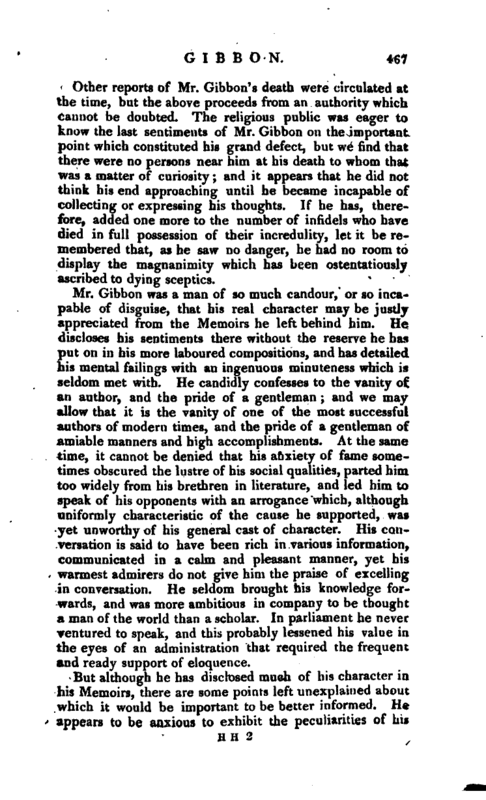 Mr. Gibbon was a man of so much candour, or so incapable of disguise, that his real character may be justly appreciated from the Memoirs he left behind him. He discloses his sentiments there without the reserve he has put on in his more laboured compositions, and has detailed his mental failings with an ingenuous minuteness which is seldom met with. He candidly confesses to the vanity of an author, and the pride of a gentleman; and we may allow that it is the vanity of one of the most successful authors of modern times, and the pride of a gentleman of amiable manners and high accomplishments. At the same time, it cannot be denied that his anxiety of fame sometimes obscured the lustre of his social qualities, parted him too widely from his brethren in literature, and led him to speak of his opponents with an arrogance which, although uniformly characteristic of the cause he supported, was yet unworthy of his general cast of character. His conversation is said to have been rich in various information, communicated in a calm and pleasant manner, yet his warmest admirers do not give him the praise of excelling in conversation. He seldom brought his knowledge forwards, and was more ambitious in company to be thought a man of the world than a scholar. In parliament he never ventured to speak, and this probably lessened his value in the eyes of an administration that required the frequent and ready support of eloquence. But although he has disclosed much of his character in his Memoirs, there are some points left unexplained about which it would be important to be better informed. He appears to be anxious to exhibit the peculiarities of his | temper, and the petty habits of his life, and he has givetj such ample details of the progress of his studies, from the first cjuPil perusal of a book, to the completion of his history as no scholar can peruse without interest and admiration. But he has not told us much of the progress of opinions in his mind. His conversion to popery is a boyish whim, which can never be contemplated in the grave light in which he has represented it. His returned to protestantism is related with more brevity and obscurity. What passed in his mind during his first years of maturity, we know not, but on the publication of his History, we find him an implacable enemy to Christianity, without the pretence of a quarrel, or any previous declaration of hostilities. It has been justly remarked by professor Porson, that “he often makes, where he cannot readily find, an occasion to insult our religion, which he hates so cordially, that be might seem to revenge some personal injury.” But by what train of reading, or interchange of sentiments, he acquired this inveteracy, he has not thought proper to inform us. Left to conjecture, it is not unreasonable for us to suppose, that his intimacy with the French writers on the side of infidelity, and particularly with Helvetius; and the correspondence he carried on with Hume, to whom he looked up with the reverence of a pupil, induced him to> think that the more he departed from the Christian belief, the nearer he approached to the perfection of the philosophical character. As a historian, the universal acknowledgment of the literary world has placed him in the very highest rank; and in that rank, had his taste been equal to his knowledge, if his vast powers of intellect could have descended to simplicity of narrative, he would have stood without a rival. But in all the varied charms of an interesting an-d pathetic detail, and perhaps in the more important article of fidelity, he is certainly inferior to Robertson as much as he excels that writer in extent of knowledge, and in the comprehensive grasp of a penetrating mind. If he is likewise superior to Hume in these respect^ he falls short of what he has himself so admirably characterised as “the careless, inimitable beauties” of that writer. Hume told him very candidly and justly, that his study of the French writers led him into a style more poetical and figurative, and more highly coloured than our language seems to admit of in historical composition. 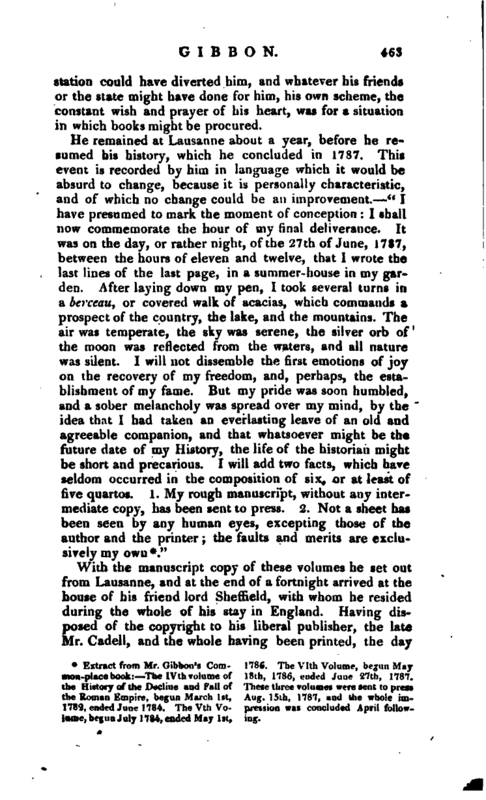 We find, in his correspondence, | that during his first residence abroad, he had ajmost entirely lost his native language, and although he recovered it afterwards, during die twenty years he passed in England, yet his reading was so much confined to French authors, that when he attempted English composition, he every where discovered the turns of thought and expression by which his mind was imbued. It has been asserted that his style has the appearance of labour, yet we know not how to reconcile much effort with his declaration, that the copy sent to the press was the only one he ever wrote. His labour might be bestowed in revolving the subject hi his mind; and as his memory was great, he might commit it to paper, without the necessity of addition or correction. By whatever means, he soon formed a style peculiar to himself, a mixture of dignity and levity, which, although difficult at first, probably became easy by practice, and even habitual, for his Memoirs are written in the exact manner of his History, and the most trivial events of his life are related in the same stately periods with which he embellishes the lives of heroes, and the fate of empires. His epistolary correspondence is in general more free from stiffness, and occasionally assumes the gaiety and familiarity suited to this species of composition. In 1796, Mr. Gibbon’s friend, lord Sheffield, published, in two volumes quarto, his “Miscellaneous Works,” with those “Memoirs” composed by himself, to which we have so often referred. 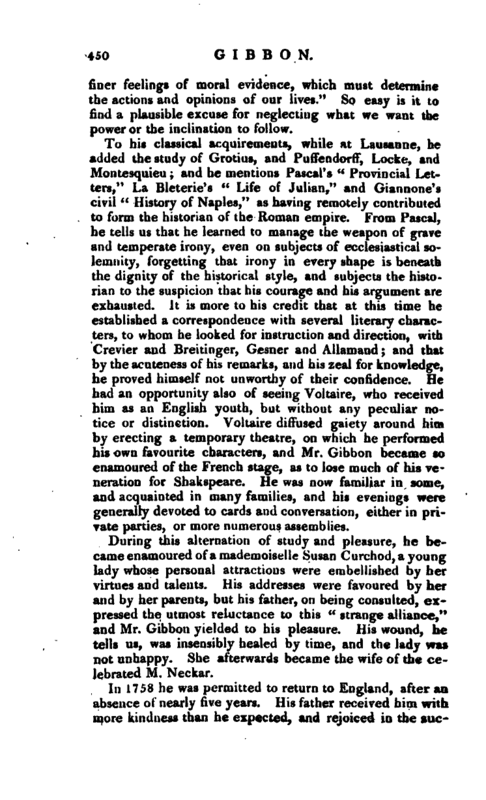 This publication contains likewise, a large collection of letters written by, or to, Mr. Gibbon; abstracts of the books he read, with reflections; extracts from the journal of his studies; a collection of his remarks and detached pieces on different subjects; outlines of his History of the World; a republication of his “Essai sur l’Etude;” critical observations on the design of the sixth book of the Æneid; a dissertation on the subject of l’Homme au Masque de Fer; “Memoir Justificatif pour servir de Reponse a PExpos6 de la Cour de France;” his vindication of his History; antiquities of the house of Brunswick; and an address to the public, on the subject of a complete edition of our ancient historians. 1 Sheffield’s Life of Gibbon, 2 vols. 4to.